The law of Karma states that whatever actions we engage will return to us in full with the aim of teaching us a lesson. The aim of this return is to teach us a lesson we will never forget or one that will make us better actors in the world. This means that our deeds, words, actions, thoughts, feelings, etc determine our fate. Practically speaking, out fate is in our hands. Everyone has had a negative act or thought sometimes in the past. This can sometimes be scaring knowing that these actions will one day return to us. However, the situation is not that desperate. You have a chance of balancing the bad deeds with good ones thus achieving stability with your energy. It helps you to break the cycle and introduce good deeds into your life. This can be achieved in three ways. This is where you let the negative bound your way to hit you. You are ready for the consequences which in most cases are dire. You have to handle the struggle and hardship that arises out of such return. The completion of the Karma cycle might see an increase in arguments with relatives, soul mates, friends, associates, etc. You might also experience illness and tiredness that is unexplained. There are natural disasters and catastrophic fails that are considered karmic in nature. A flood may wipe out all possessions gotten illegally. A fire or hurricane may have a similar effect. Such an occurrence will force the affected persons to work together towards a solution. It is a position of surrender out of awareness of your bad deeds in the past, while at the same time preparing to take whatever Karma throws your way. This is a more dynamic way of achieving balance. There are many ways of fulfilling this obligation. You could serve at work, social organizations, family, etc. It means being gracious to people who come into your life. These people come in the form of strangers at the grocery store, bus stop, receptions, eateries, etc. Beyond the opportunities that fall our way, we must proactively find a way to repay or balance our negative energies. Volunteer work, catering for vulnerable people in the society, taking care of the environment, etc is other ways of achieving Karmic balance. Such acts must not attract payment and must be done out of personal volition. This is one of the most effective way to transmute karma. Violet Flame also known as Violet fire, is a unique spiritual energy which can heal, emotional, physical problems. It can help you grow spiritually and also help you improve your overall life and improve the relationship front. 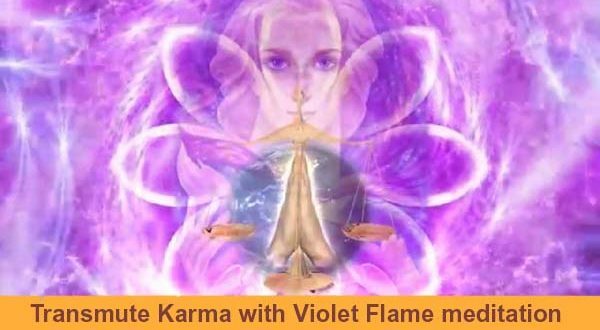 The Violet Flame has qualities of freedom, forgiveness, mercy, and transmutation. The Violet Flame has the power to erase, transmute, change the memory of the past mistakes. The Violet flame changes negative energy into positive energy. It also has the power to erase the bad karma of the past. The Violet Flame is invoked through “decreeing” – a unique form of spoken prayer utilizing visualization and meditation. The Violet flame works by changing “Vibrations” which is the speed of oscillation as per physics. It is the speed at which things move back and forth. On the atomic level vibration is the speed at which electrons orbit around the nucleus of the atom. The Violet flame works by changing vibrations on this level. Atoms are mostly empty space. The empty space between nucleus and electrons is where the negative energy gets blocked. When the atoms become clogged with negativity, the electrons whirl slower eventually making life miserable. The violet flame transmutes this negative energy. With this change, you get positive energy and this is considered the fastest way to find Karmic balance. Transmuting means changing the energy into a higher form. Invoking the higher power helps to dissolve the negativity that surrounds you. It also erases the negatives that you cannot remember allowing you to be saturated with forgiveness. Absolute cleansing does not take place. To learn some lessons, you must go through the real experiences. This violet light has the power to clear debts from your previous life. The idea here is to lessen the impact. You have an opportunity to enjoy token Karma through grace extended to the soul. Dedication to a spiritual path will also reduce the impact of Karmic attacks. All conscious attempts must be made to reduce the severity of Karmic returns.